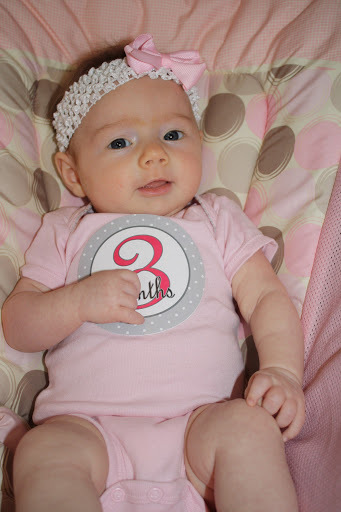 You are 3 months old today, and of course I’m going to say it- I can’t believe 1/4 of your first year has already passed! You are pure joy- you smile with your whole body and you are not stingy with your smiles; you will give them to anyone willing to talk to you. You are petite, weighing about 10 1/2 pounds, but you still love to nurse about every 2 hours. You wear size 3 month clothes and size 1 diapers. Your naps are sporadic and a lot of times short, but that’s my fault as we are usually on the go during the day and haven’t established any kind of a daytime schedule. However, you are an awesome sleeper at night! You go to bed about 6:30 pm, sleep 7-8 hour stretches and then usually go straight back to sleep after you eat. You love your brother. You want so badly to engage and play with Grayson, but unfortunately, he doesn’t have much interest in you yet. But the way you watch him and smile at him makes my heart so happy. He’ll come around. For the most part, you are a happy, smiley baby. But when you don’t get your way (read: when someone isn’t holding you) you aren’t shy in letting us know your dissatisfaction. You sure can scream! I love you so much and love watching your sweet, spunky personality develop. 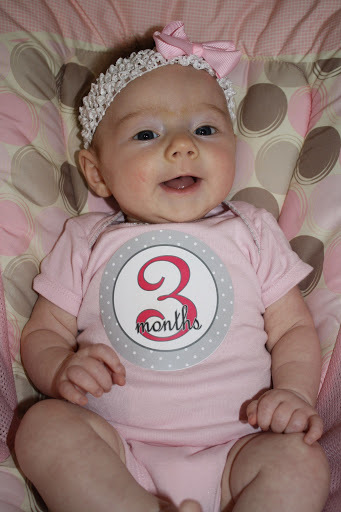 Happy 3 Months baby girl! Oh my she is perfection! Love that precious smile, absolutely adorable!!!! 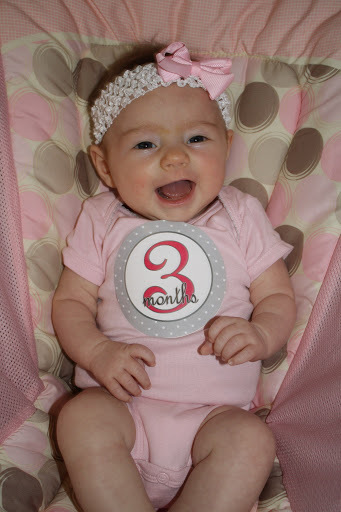 Happy happy 3 months sweet baby girl!!!!! She is so cute and has the sweetest smile! I think it will be so much fun to watch them interact when she becomes a little more interesting to Grayson! I'm so glad your second chance at nursing is going well. That makes me so happy for you! I know you wanted that to work out so badly! She, and this letter, are just awesome and beautiful! Such a sweet girl. Oh my gosh, she is so sweet! Happy 3 months!! !